Self-confidence is one of the key ingredients to living a full, happy, and successful life. Unfortunately, many people suffer from a lack of this quality because they’re embarrassed by flaws in their appearance, including noticeable imperfections in their smile. 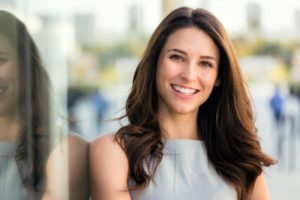 If you hesitate to let your real personality shine because you don’t like the way your teeth look, you may benefit from a visit to a cosmetic dentist near Reston. They offer treatments that can dramatically improve your smile’s appearance! If your teeth look yellow or dull, professional whitening can attack stains and give your look a whole new luster. Many dentists offer both in-office and take-home bleaching treatments that safely deliver fast, reliable results. If you have cracks or chips in your teeth, porcelain veneers or Lumineers can reshape those pearly whites in just a couple of appointments with your dentist near Reston. These treatments may also be able to disguise slightly crooked teeth or small gaps between the teeth. If your have excessive or uneven gum tissue, a recontouring procedure can give your smile a more proportionate appearance. If your teeth are too crooked to be fixed by veneers or Lumineers, orthodontic treatment (such as braces or Invisalign) can gently move them into their proper positions. After your cosmetic treatment, you may notice that you smile more. Smiling, in turn, draws other people to you and makes you seem younger and more approachable. A beautiful smile can help you in your career. When you smile more, you convey the impression that you’re trustworthy and eager to connect with others. Healthy, attractive teeth can even make others perceive you as being more successful. A smile makeover could help you to overcome a traumatic past. If an accident resulted in a broken or missing tooth, eliminating the visual reminder of the incident may help you put it out of your mind and so you can move on to a brighter future. Some cosmetic treatments, such as braces or Invisalign, can make your mouth healthier. Straight teeth are easier to clean than crooked ones, so you could find that your breath is fresher. Therefore, you may feel better about getting up close and personal with other people. 2019 is still young. Why not make this the year that you let cosmetic dentistry help you capture the confidence that you’ve been missing? When you feel great about your smile, there is no limit to what you may be able to accomplish! Dr. Farshad Bakhtyari is a general dentist who has undergone extensive training in cosmetic techniques. If you would like to discover how he can transform your teeth and reveal your smile’s true potential, contact our office at 703-860-8860.